Taking care of your baby, truth be told, don’t require much besides diapers, clothes and a safe sleeping space as well as a couple of other essentials. But then there are quite a few things you could purchase in the form of gadgets to make life easier and provide baby with the coolest stuff. If you can make a baby register or your savings for the arrival of a newborn makes provision for more than just the basic stuff, we have quite a few super-cool gadgets and other items you might be interested in. 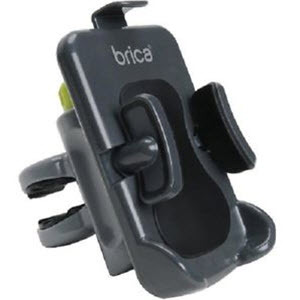 The Brica Phone Holder for Stroller is perfect for when baby sleep during a stroll and you wish to listen to music, or you want to keep your phone constantly in view to make sure you don’t miss any messages. The phone holder for strollers also keep your mobile secure and it can be attached to the front of the stroller should you wish to play videos to keep baby entertained. The importance of a Baby Shusher is best known by those who want the happiest baby of the day, the sounds provided by the shusher is calming, and it keeps baby happy and peaceful. Know the temperature of the bath water, babies’ milk and even the air. This is a great way to check that the temperature of all things concerning the baby is perfect, it is also brilliant for checking baby’s temperature during the night. Gro-Egg quickly shows when the room is to cool as it turns blue, when the room is to hot it turns red and when its perfect it has an orange to yellow colour. Most new mommies use their phone flashlight to enter the room of the baby. However, should you wish to have one of those “how awesome” kind of nightlights, then the new Boon Glo is what you need. It has portable orbs that can be removed and then turn green when they detached from the base, yet they still glow, and it makes moving around in the room of the baby much easier. After transferring the baby to the big bath, you will need to kneel in front of the bath, and this is also the time you find out that the usual rug is all but easy on your knees. 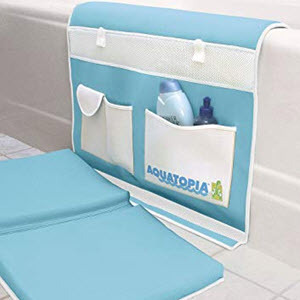 What you need is the Aquatopia Kneeler for Bath-time, which solves all your problems of ending up with sore knees while it also offers great slots for soap as well as shampoo. Once it is time for baby to start enjoying solids, it could be quite a messy affair, and with the Squirt Dispensing Baby Spoon, this transition is much easier since it allows you to have one hand free. There are a few tear-free shampoos available, but often these are not able to do the trick, the Lil Rinse Splashguard is what you need to keep shampoo or soap out of the baby’s eyes, and bath-time could indeed be the most fun time.